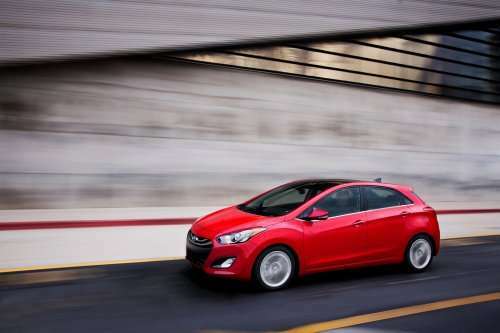 The tiny little powerhouse of hatchback fun, the Hyundai Elantra GT, has been priced at well under $19,000 and outperforms the competition Focus, Mazda3, and Golf in both price and versatility. The fun little Hyundai Elantra GT just got better with one more "best-in-class" added to its long list of bests. The subcompact five-door already has class-leading fuel economy and specific output at 39mpg highway and 82.2 horsepower per liter (total of 148). It also beats the Ford Focus, Mazda3, Volkswagen Golf, and Toyota Matrix in passenger and maximum cargo volume and has better aerodynamics than the Subaru Impreza, Toyota Matrix, or VW Golf. So what could the Elantra GT possibly add to this list of bests? How about a price tag well under $19,000? Beginning MSRP for the Elantra GT in 6-speed manual transmission is $18,395 plus destination and upgrading that to the convenience of an automatic while retaining all of the fun driver control options, thanks to Hyundai's 6-speed automatic with SHIFTRONIC®, brings the MSRP to only $19,395 plus destination. The lightest five-door hatchback in this segment, the Elantra GT has sport-tuned suspension, heated front seats as standard, a driver knee airbag, an optional rear camera, and an advanced 1.8-liter four-cylinder engine. The Elantra GT is available as a PZEV and ULEV. For those who have driven a new Elantra GT, the styling is unusually powerful for a car in this segment and the on-road experience is strangely gratifying - even fun. Something you rarely see in a compact hatchback. The all-new Driver Selectable Steering Mode allows three easily-selectable modes for driving style, including Comfort, Normal, and Sport. In Sport mode, better feedback and a tighter feel in cornering is given while in Comfort, more play is allowed to let you sit back and cruise on those long commutes. The fuel efficiency is the same whether you choose manual or automatic transmission. All of the technology and style normally expected in today's vehicles are included in the base package, such as Bluetooth, cruise control, driver's seat height adjustment, telescoping/tilting steering wheel, a rear seat center armrest with cup holders, chrome grille, fog lamps, etc. Upgrade packages include both a Style Package for added alloy wheels, sunroof, leather seating, and aluminum pedals and a next-level Technology Package with navigation, rear view backing camera, automatic headlamps, and automatic temperature control. All in all, a very competitive car in this segment and one that will likely set the bar for the compact 5-door arena. Needs the 2.0 Turbo with 274HP from the Sonata. That would be a rocket!